To read our full review of the Fujifilm X-S1, click here. One of the most compelling superzoom cameras of recent times, the X-S1 earned high praise in its review earlier this year for a variety of reasons. 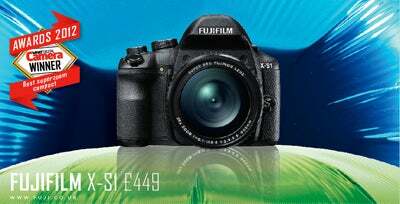 Its specifications, which include a 12MP EXR CMOS sensor fronted by a 24-624mm optic, an articulating LCD screen and a 7fps burst shooting mode are impressive enough in themselves, but it is its performance that made it shine even brighter. We found the camera’s electronic viewfinder reproduced the scene excellently, while the effective image stabilisation system helped keep images sharp in more demanding shooting conditions. This, together with a largely sound metering system and excellent noise control, as well as a lens surprisingly free from many distortions, makes it easily recommendable to those looking for a powerful all-purpose camera for less than the price of a DSLR with a superzoom optic.